Note: This journey was originally recorded in Facebook, and there were many comments and photos added by the people I met along the trail. Those comments and photos are not shown here, but may be found on my Facebook page. (click the link above, go to the "Links" page, and click link to my Facebook page). Please read the following SEVEN FLYERS, and if the words ring true to you, than we are on the same page, and we need one another's help. I am a NOTtrying to sell you anything, ask for money, or your vote. I have a plan. It ain’t much of a plan, but with faith, it doesn’t have to be. 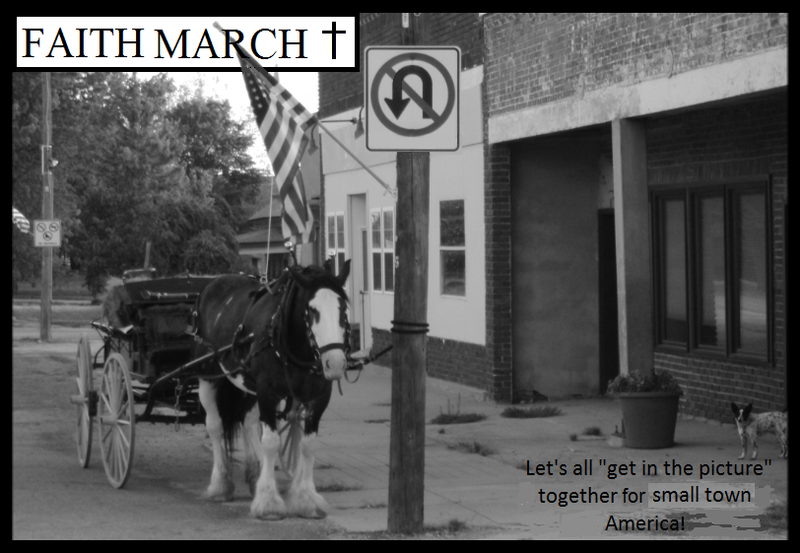 I am proposing a march for rural and small town America. If folks are not receptive to marching, than perhaps my job is only to plant a seed by asking them to read these seven flyers (I believe however that if we do not march now, we will come to wish we had later). In June of 2012, I will begin a journey by horse and wagon. Using rural roads, I will go from town to town. In each town, I will ask for one man to come with me. I will ask the people of that town to sponsor their man by paying his expenses consisting of food, sleeping bag, etc. His expenses will be between himself and the people of his township. Then, God willing, this will become a march, with supply wagons pulled by horses and mules. Note: You can view this jouney via the photo/video journal at bottom of this blog. The goal of this march will be to give faith a chance to do what we know it can do, as proven by our pilgrim and pioneer forefathers and mothers. The destination of this march is to where God leads. And if that sounds strange, think about it. We could march to DC and hear the same old speeches. We could help small towns with clean-up and fix-up projects. We could march to Vegas, peacefully block the arteries of evil, and force our enemy into the open to defend the very things that are destroying America. But to begin, we must put our trust in God, and by walking with Him, remember who we are, where we come from, and what we’re made of. Instead of growing weak, we can grow strong in the One who holds our best interest at heart. Our blessings are on the line. So please read this all the way through. Culture begins with love and loyalty for one’s people and their way of life. Culture, as God intended it, is human poetry in motion, rich with mannerisms and ways of expression not defined by statements of income, or even by great works of art, but rather by what we hold dear in our hearts. Though love and loyalty, sense of appreciation, and of belonging, a strong cultural bond makes for peace and harmony in small town America, something that big cities, for all their power and wealth, cannot honestly claim. Culture, not as defined by those who look for it in art museums, or in Hollywood movies, or Fifth Avenue adds, but rather, real flesh and blood culture is a gift, from God, given to the smallest, that they may have peace, harmony, and happiness. Note: I am not against people of other cultures, multi-cultural folks included. Rather, I am about the incredible importance of culture, as key to the survival of my people, or any people. Our heritage begins with the story of the Pilgrims in the Mayflower, who through trial of faith became the wind in the sails of the pioneers in their “prairie schooners,” who in turn gave rise to that generation that defeated the Nazis and went to the moon. Not a perfect story (there’s no such thing), but it’s our story, a wonderful story of faith and courage! And for those of us who have not yet become detached from the value of it, who are not yet blind to the beauty of our bond, and therefore not yet prone to cruelty by the act of taking it away from those of us who depend upon it – praise the Lord - we are not yet so “great” as to destroy the roots from which we grew great. and go forward like those who came before. Today, while our freedom slips away; we seem lost, not knowing what to do. The answer is simple. My name is James, and I recently walked 1,000 miles, and paddled a canoe 3,000 miles through America. My dog UB and I made the 4,000 mile journey under our own power and finances but not without the assistance of a great many kind people who stepped forward to help. Not prearranged help, but 100% spontaneous help. It was truly amazing, the way people kept coming forward like angels out of the blue! For two years UB and I crossed mountains, deserts, and plains. There were blizzards, bandits, and bears. But above all, there was faith, and I came away with a deep appreciation for God, my people, our pilgrim and pioneer forefathers and mothers, and the tremendous risks and hardships they heroically undertook for freedom. DEFINE OURSELVES AS A PEOPLE. TO SURVIVE AS GOD WOULD HAVE US TO, WE MUST HAVE A PLAN. OTHERWISE, WE WILL BECOME PART OF SOMEONE ELSE’S PLAN. We don’t need China to make our pots and pans - only a foolish people would allow foreigners to come between their stomachs and the crops in the fields. In fact, we have become a people who depend on foreigners even for our shoes! And as must be expected, righting such a situation will require many pairs of good shoes - and we can make those shoes! We can make pots and pans. We can grind grain, bake bread, and do a whole lot more right here in rural and small town America. We can build practical energy systems to meet practical needs. Of course we can’t do it all. We need our city cousins, they need us, and we all need some government and corporations. But if we want freedom, we must be independent, and today, we are not. To regain our independence, we need only rely on God, that a few of us may follow Him into unknown territory, same as our forefathers and mothers who opened up a frontier, into which a hoard of hopeful hearts did follow, to build the land of the free. As mentioned, I recently made a journey through America… it was as real as it gets. With no doors to lock or walls to sleep behind, I traveled from one little town to the next. After 4,000 miles, there was no room for doubt. Small towns with a strong cultural bond were things of beauty; safe and happy, neat and clean, with togetherness and good humor prevailing even in difficult times. Without the bond; trash, graffiti, and public bathrooms closed due to vandalism were among the warning signs that told of an unsafe and unhappy place. It was an eye-opening experience. God showed me the truth, and to my surprise, it wasn’t something everyone rushes to, but to the contrary, something a great many have turned away from. After my journey, I worried so for all people; I lost a lot of sleep for 4½ years while doing my best possible humanly effort to write in a way that would not inspire anyone to hate even while I drove home the truth of what I saw - the cultural bond, in small communities, is pretty much all folks have. I say it's "all they have." It is also something God made too big to be measured by men. It is of immense beauty, more basic than I have words to describe, except to say it can be read in the faces of small town folk as they converse on their streets, and in their little stores - it is their closeness with one another, their bond, the roots of their peace, harmony, and happiness. Take it away; and you may as well put them in hell. The traditional white people of rural and small town America are proven humble by the way in which they’ve so quietly disappeared (even while struggling to keep America fed). Hate keeps the multi-cultural extremists from seeing the love and loyalty that is the beauty of the cultural bond, without which small communities cannot keep the peace and harmony essential to their happiness. Ignorance and bias makes the multi-cultural radical seek the destruction of the bond. With eyes closed tight in the name of "justice," multi-cultural fanatics would put Eskimos in with Aborigines (so to speak) until the face of small town America was made-over in an attempt to achieve an ideological ideal, but they would only succeed in breaking the bond that holds these communities together. This bond is the same everywhere around the world, and all people have a right to it. The “mainstream media” exercises extraordinary control over what Americans see and hear, and have falsely portrayed rural and small town America as backward, bias, and hostile. This false portrayal speaks loudly about the mainstream media and their lack of appreciation. The truth is that, in America, a golden bushel of grain sprouts not only from good soil and hard work, but from social stability, itself sprouted from the unity of a people bound by love and loyalty (that feeds the world). It is a beautiful thing, how a life-sustaining bushel of grain is grown in the land of the free. It is by extraordinary detachment that a so called mainstream media and others turn a blind eye to the truth while eating America's bread. “For the betterment of humanity,” the socialist are trying to wipe us out, and the capitalist are selling us out. And because this is a disaster for us, we are in need of God’s wisdom, which undoubtedly will leave some people out, but only by their own choice, while we turn to follow Him, without malice for others, but simply taking it on our shoulders to preserve our blessings. blanket of ideology, with “justice” for all – not! dressed in shiny bells and whistles. Jesus became the world’s greatest hope, not by being a man of the world, but by being a man of His people. With their best interest at heart, and his feet on the ground, He went walking from town to town. And what else would one expect when love without loyalty is a lie. The fact that Jesus walked, not walked in concept, but literally walked among his people was His way of showing the difference between what is real and false, between truth and lies, right and wrong, good and evil. This is one of the great lessons of Christ; I am to live in an honest state of being. When I go out my front door, I must face reality like God created me to. And although I am not strong enough to live as He would have me to, I am set free by His truth. Regarding the “infrastructure of destruction” stated above: The current system is destructive, but it is also creative. And because I haven’t the wisdom to get myself beyond the conundrum of knowing which choices are more of one than the other, I follow the One who can. By following His word, I avoid sin. By watching how He makes things to work in nature, I learn from designs that support life, as opposed to destroying body, soul, home, town, and nation through a series of sin-based decisions. When I was a boy, my dad died and mom never remarried but besides loving me and taking care of me and making sure I went to church every Sunday, the greatest thing she ever did for me was to get down on her knees before me when I was six years old and tell me that a woman could not show a man how to be a man. She then turned me around so that I was facing a group of men (rural and small town Americans) whereupon she told me to go and watch, listen, and learn. That was the beginning of my life as a scout. With a fatherless void in my chest, I had all the incentive I needed. I began by scouting my people, followed by the people of other cultures. As a result, I have studied a great many people, not with conscious intent, not as part of an academic study, not with anything but a void to fill in my chest, a void which felt as big as space itself. Into that void, I shoveled everything from John Wayne to Woody Allen. I shoveled until I was plumb full. And when I had filled myself up, I was as confused as ever. That’s right, I didn’t know who I was, and all the knowledge in the world couldn’t help me. Then I heard my long forgotten friend Jesus calling, and somehow, almost like groping in the dark, I found my way back to Him. He took what I had put inside and brought it to life. And when He did, it was like nothing I can describe except to say my void filled with light, my eyes could see at last, my stars and planets were put in order and I was filled with joy. That is what God did for me. He stoked my heart like the furnace of an iron horse, and it blazed with gratitude. After I was saved, I was so stoked… I took my journey through America. God, however, didn’t want me to go testifying from town to town (perhaps I wasn’t ready for that). He only wanted me to make it from point A to B with 4,000 miles between… that was His wisdom. Through deep appreciation for those who came before and for those here today, I came away with the truth regarding the importance of culture. After my journey, God didn’t want me to forget what I’d learned. So it was, I “chanced” on a friendship with the Amish who blew my mind on more than one occasion. Once, while working a horse in a round pen on an Amish farm, I noticed a procession of six or seven Amish girls, dressed like pioneers, walking the country lane. The oldest looked to be twelve, leading the way with direction, but not at all severe. The youngest was about five, and brought up the rear. To my surprise, they turned up the driveway of the farm where I worked. I didn’t know what to think but figured it an Amish thing. I watched as they continued without adult supervision, but each knowing their task, fetched a stocky miniature horse, then a miniature covered wagon. They harnessed the horse, hitched it to wagon, boarded one by one, and as they drove away, they smiled and waved at me. Astonished, I went in the barn to ask my Amish friend what I had seen. He said the girls had stopped that morning and left the horse to be shod before continuing on foot to the one room schoolhouse up the lane. They were not all sisters but children of the community. I’d seen a miniature school transportation system operated by children, working together, without adult supervision; independent, efficient, safe, clean, and yes of course, happy! I’m not saying that the Amish are any better than any other people. As a scout, I know from direct experience that, white, black, red, yellow, brown, rich or poor, right or left… we are all wonderful, and we are all pathetic. I’m just using the Amish as an example, to show the goodness of a strong cultural bond. On the other side of the coin, I know that mixing cultures can be an equally positive part of the human experience, so long as it’s voluntary. And therein is the danger because, unfortunately in America today, there’s a new extremism that, if given power, would make multi-culturalism mandatory, and punish those with a different view. Extremist as mentioned above do not view the world directly - but indirectly - from universities, corporations, government blocks, foundations, media outlets, and the like. And while their intentions may be good, their social remedies are skewed by a detachment that allows anger, greed, pride, and other sins to pass under banners of “justice” and “freedom.” I am not saying that I am better, or that I have the answers, but as a scout; I walked through this land, not to make a report, but in the belief that through faith there would be something better: I put my neck on the line for 4,000 miles - and I can honestly say; I came away with the truth regarding the incredible importance of the cultural bond, not for just any group of people, but for any group that centers itself on faith in God. Those who follow the so-called remedies of the state, or market, will march into darkness – but those who follow God (not in concept, but as their forefathers and mothers did) will take the risks, work hard, and grow in the very light that made America great. We must turn away from a lifestyle that makes us dependent on those who do not hold our best interest at heart, and turn in the direction of our forefathers and mothers who depended on God, one step at a time, in unknown territory, to build the freest nation on earth. And although we go into unknown territory, we will carry the same blueprint they carried, the Holy Bible, which includes the teachings of Jesus, and the Ten Commandments. We must start by coming together in the spirit of the Jews who left ancient Egypt, and while we muster, we must let the world know, we are not going away, and we are not asking others to go away. What we are is fast disappearing, our little towns and farms are dying, the things we hold near and dear are crumbling away - and so it is - WE MUST MAKE A STAND. We must defend our flanks from the attacks of our enemies. Today in America, we are singled out by those who think it just to cast shame on our pilgrim and pioneer forefathers and mothers even though all groups are descendents of sinners. We must know that, if we allow our enemies to destroy our heritage, than we allow them to destroy our culture, and if we allow them to destroy our culture, we allow them to destroy us. For example, by vilifying the pilgrims and pioneers who settled this land, angry ideologues have fostered an environment that undermines our children by denying them their God given right to feel good about where they come from, what they’re made of, and who they are. The void created in these kids is then filled with garbage from Hollywood, Fifth Avenue, and others in a race for obscene amounts of power and money. We must use the millions we spend on junk food and beverage to redeem our health, and by such means, [show our gratitude to God for our gift of life, and] strengthen ourselves as a people so we can hold on to our little towns and farms. We must get back to being a people who make their own wares - with imagination, resourcefulness, and pride. By being godly with our hands in the care of things, we can be strong enough to make the basic things we need to survive - strong enough to say “no thanks” to ungodly men who seek advantage over us, pervert us to their ungodly ways, and lead us to destruction. We can benefit from government and corporations as long as they do not destroy our freedom in their relentless pursuit of power and money. We can benefit from large technology platforms like the railroad and internet as long as they can be modified to run clean, both kinds of clean. Technology should assist us in keeping healthy and independent. Healthy and Independent, not as defined by those who only pretend to hold our best interest at heart, but by we who, like our pioneer forefathers and mothers, truly want a better life (as proven by the risks they took). A new frontier of clean freedom-based technology is waiting to be opened - the key is as near as our faith, courage, and imagination. · Media and education – we control it in our communities as a people who agree on what our children should see and hear. · Taxes – we will not pay for a disaster created by socialist and capitalist fools. · Law Enforcement – we keep the peace in our communities as we see fit. · Freedom - because we know how to keep it better than those who do not hold our best interest at heart. GREATER THAN THEIR ABILITY TO IMAGINE. 1) When the Lord calls you, remember that most Americans say they want peace and happiness, and they talk about it while their streets become less safe and their streams less clean. They know they're on a path to spiritual and physical destruction, and will likely appreciate the sincere effort of anyone who tries to find a better way. 2) Join a group who have heard the call and are willing to brave the unknown in the pursuit of safe streets and clean streams. Get organized, insists on autonomy, not as separatist but as trailblazers, and remember that when the pilgrims came to America, half died within a year but the survivors persevered, and 400 years later, their dream still lives. 3) Know that although your path will be hard – the yoke of truth will liberate you (by doing the right thing, you will be right in your soul). Truth, is knowing that you don’t have the answers but are going forward in faith that God will show a way. it will be as difficult as it is full of promise. God keeps faith with those who keep faith in Him. PLEASE CLICK ON "Older Post" BELOW TO CONTINUE.